Yesterday was the start of British Food Fortnight, which celebrates British food and drink. We will be sharing recipes with you throughout the fortnight to showcase the wonderful range of British ingredients that are available now. Our first recipe is from Discover Leeks. 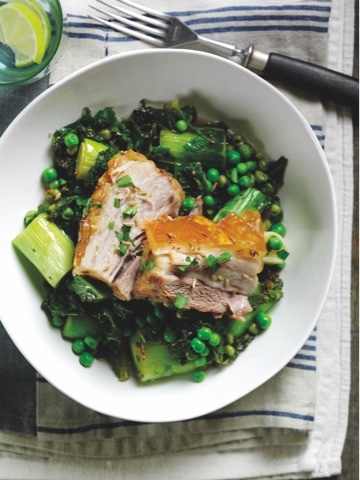 This slow roasted pork with braised leeks look amazing. The dish looks fresh and vibrant - the green colours of the leeks, peas and kale really pop! I love both leeks and belly pork, so this recipe is definitely going on my list of recipes to try. Season the pork and sprinkle over the fennel seeds, place in a small roasting tin with 250ml stock. Roast for 15 minutes. Reduce the oven temperature to 150oC, gas mark 2 and continue to cook for 2 hours until tender. Meanwhile, place the leeks, kale and peas in a large frying pan and pour over the remaining stock, cranberry sauce and mustard. Cover and simmer for 5 minutes. Cut the pork in half and serve with the braised leeks and kale. Stir a grated apple into the braised vegetables for extra flavour. Thanks to Discover Leeks for allowing us to share this recipe. Visit www.discoverleeks.co.uk to find more delicious recipes and ideas for using leeks.